Last week Jon went to the produce store with a list which included my request to get 2 green veggies for dinners. He came home with broccoli and Brussels sprouts. I haven't made Brussels sprouts in several weeks, maybe a few months, but we both love them so I was looking forward to trying something new. 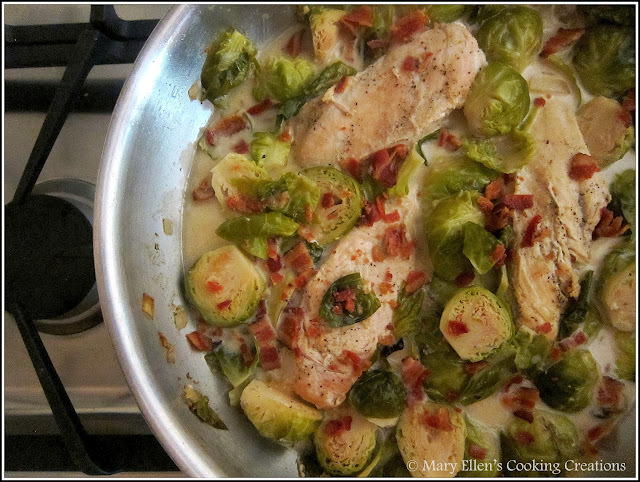 I planned on cooking chicken and since I really didn't feel like having a big mess to clean up, I started to think about one-pot cooking. 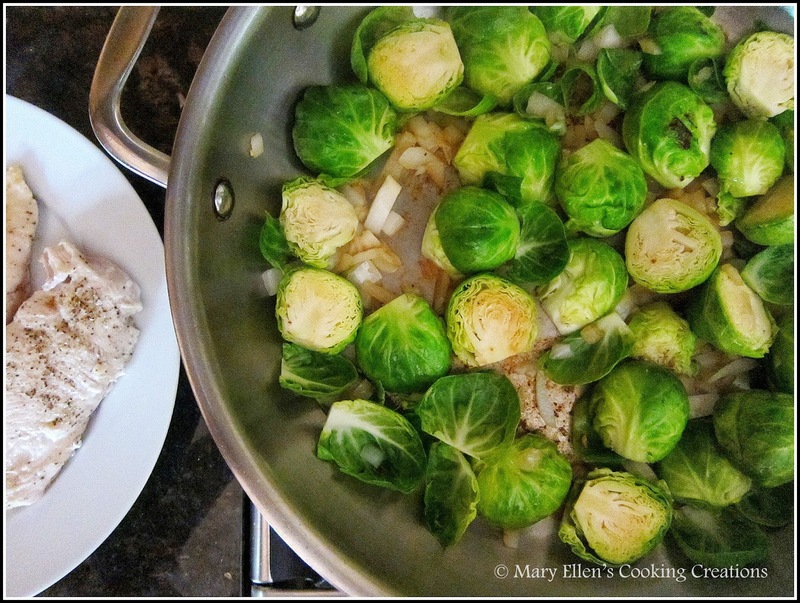 I did some Google searches and came across a simple but elegant looking Martha Stewart recipe for Braised Chicken and Brussels Sprouts. After reading it I did what I usually do - made a mental list of changes I'd make while cooking. The recipe called for a whole chicken but I used 3 chicken breasts. This also reduced the cooking time. I increased the liquid just a bit to have more sauce, used sweet onion instead of shallots, and garnished the dish with crispy, crumbled bacon. Now, I usually make a carb with dinner, but honestly, I didn't feel like it. And once I started to cook and plate everything, I realized we wouldn't even need one. Noodles or potatoes or rice would just take away from this dish.. although some good crusty bread would have been nice for sopping up the sauce. Next time! We both loved this, and devoured the entire thing. 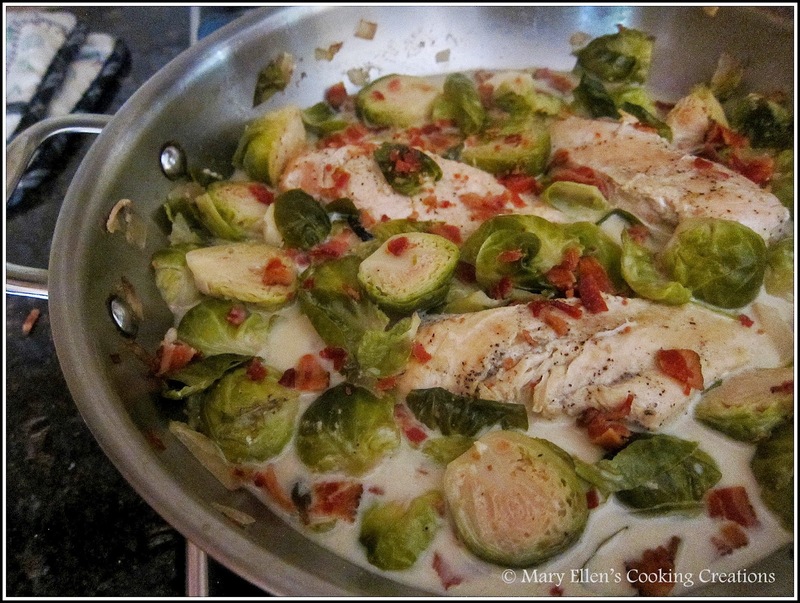 The Brussels sprouts were perfectly fork tender, the sauce was tangy, and the bacon added a touch of salt and crunch. I can't wait to make this again. 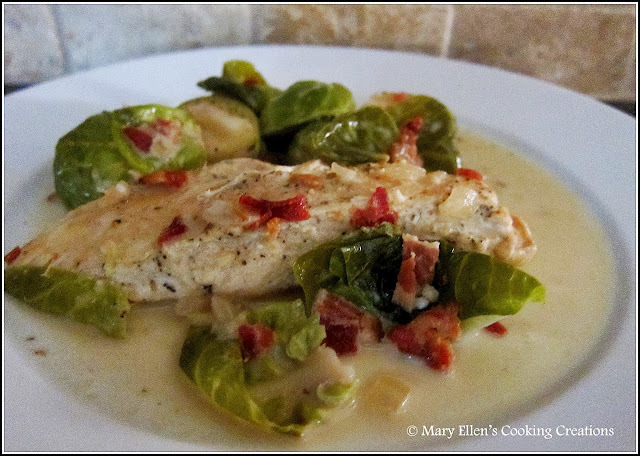 Season chicken with salt and pepper and add to the pan. Cook 3-4 min per side until golden brown, but not cooked through. Transfer to a plate. Cover and transfer to the oven until chicken is cooked through, about 10-15 minutes. This looks awesome - can't wait to try it this fall! OMG - yum. My mouth literally watered when I read the ingredients. love love love this idea! Can't wait to try it.